Greece is finally running out of road. But could the plethora of panicky headlines merely be a prelude to a deal? It’s been apparent for the past few months that Greece is running out of money and would need to strike a deal with its creditors before massive repayments on bonds held by the European Central Bank fall due towards the end of July. But now it appears Greece won’t be able to cover repayments to the International Monetary Fund a month earlier, starting with a €300 million ($339 million) loan on June 5. Indeed, the only reason Greece was able to make payment on a pair of IMF loans earlier this month was because its government tapped an emergency IMF lending facility. In other words it borrowed from the IMF to pay the IMF. As if that wasn’t enough, Greek banks are running out of fresh collateral against which to draw funds from the European Central Bank’s emergency liquidity assistance facility to cover lost deposits. Greek banks drew some €74 billion from the ELA by the end of April and the ECB last week raised the limit to €80 billion. 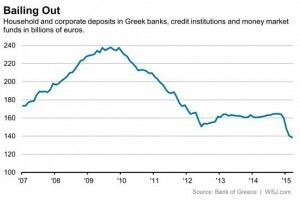 Deposit outflows are running at between €1.5 billion and €2 billion a week. And as it stands, Greek banks have enough collateral to potentially draw a total of €95 billion under current ECB rules, enough to last roughly until the end of June. Were deposit flight to quicken, or the ECB to demand bigger margins on collateral, and that date would be brought forward. A Greek government spokesman Monday aimed to soothe concerns that deposits would be locked up, a real fear while memories of losses suffered by Cypriot neighbors are so fresh. “There will not be a Cyprus-like solution [in Greece],” said government spokesman Gabriel Sakellaridis during a press conference Monday. “There will not a bail-in option on deposits,” he added. Meanwhile, the Greek government is struggling to cover its ordinary bills. It can cover wages and pensions this month, according to a government spokesman, but then the crunch comes. All of which boils down to the fact that Greece’s Syriza government has at most a month-and-a-half to strike a deal with its creditors, but probably really only a couple of weeks.